Two days ago looking at the Alfazal International, I saw the reminder Hazrat Khalifatul Masih II (ra) had given regarding the need to preserve the advices of the still present Companions of the Promised Messiah (as). This was in 1937 and he said that the need of such advice being preserved would become very obvious in later times. He narrates by way of example a Companion who said that when he was very small, one day he took a hold of the Promised Messiah (as)’s hand and held on to it for quite a while. After some time the Promised Messiah (as) separated his hand and became involved in some work that needed his attention. Hazrat Khalifatul Masih II (ra) writes, that he said that “although I am a Companion this is all that I remember,” but even from such statements many results can deduced. For example from this small statement we learn that even small children should be brought to the meetings of elders. Also that when the need arises, lovingly get your hand freed. The Promised Messiah (as) kept holding the hand but when the need to do something arose, he lovingly got his hand released. Hazrat Khalifatul Masih II (ra) writes that such things provide sometimes answers for questions that arise later. So even the smallest things that are narrated that happened with the Promised Messiah (as) have a lesson. Hazrat Khalifatul Masih II (ra) has mentioned in his addresses and in his writings some incidents that he was involved in. They contain lessons, they contain advices, and they contain history. They also contain information about the life of the Promised Messiah (as) by reading which we are shown many new aspects of his life. And all these things play a very important role in our lives. These are things that can make our lives much better. One of our devotees, Habib ur Rehman Sahib, is trying to collect all of these by taking them out from the various places they are found. This is a good attempt but this is not sufficient, because without knowing the setting or the context, just collecting the incidents does not make it clear what lesson needs to be drawn. So we will have to make some rules and put in place some methods in order to do this properly. Nevertheless, when this is done and books are printed, it is hoped that once this work is given a particular shape and form it is hoped that this will be a good addition to our storehouse of literature. At this time I have selected some incidents to mention here today. These are incidents relating to Hazrat Khalifatul Masih II (ra) himself, or they are incidents relating to others but mentioned by him. These relate to different topics and I will relate a few today and I am mentioning these in the sermons because through the MTA, the Friday Sermon is listened to most widely by the worldwide Jama’at Ahmadiyya members and because these can be very helpful in understanding some situations. So it is very important that this information reaches everyone and the Friday Sermon is the best way for this to be done. Hazrat Khalifatul Masih II (ra) writes that my age at the time was perhaps 8 or 9 years. He says that was the first day that love for Sultan Tipu took a hold of my heart and I realized that the sacrifices made by Sultan Tipu did not go to waste. Allah, the Exalted, blessed his name so much that the Imam of the age holds him and his name in high regard and his heart is filled with respect and honor for him. Then he writes that from this incident we realize that every action of a child is not to be just borne patiently in a forgiving attitude, without discrimination. We also see from this incident the immense love and affection the Promised Messiah (as) had for his people, his fellow Muslims. That child who once burnt a manuscript which the Promised Messiah (as) had probably spent hours writing and which loss he had overlooked and bore with patience, and did not care for the difficulties that he had to go through as a result, that same Promised Messiah (as) could not tolerate that a leader of the Muslim people should be so disrespected. A Muslim Sultan who was martyred in a national conflict and with whom there was no relationship of the Promised Messiah (as) other than the common faith of Islam, he could not tolerate that a child even unknowingly should repeat his name in such a way as would show disrespect for him. He could not tolerate this. In this incident there is also a lesson for those people who have the audacity to label the Promised Messiah (as) as an agent of the British. That heart which was full of patriotic fervor and held Sultan Fateh Ali Tipu in great respect simply because, instead of bowing his neck in front of the British, he sacrificed his life like a brave man that he was. How is it possible that such a proud man should ever be considered to have been an agent of a foreign nation. Then at another place Hazrat Khalifatul Masih II (ra) writes that in my opinion there is no enemy of the children greater than those parents who do not teach the children to offer their prayer in congregation. He says that he remembers an incident of his that on one occasion the Promised Messiah (as) was somewhat ill, so he could not go to the mosque to offer his Friday Prayers. I was at that time not yet an adult so that the commandments relevant for an adult should apply to me. Nevertheless, I was going to the mosque to offer the Friday Prayers when a man met me and I remember his face up till now because of the great impact that this event had on me. His name was Muhammad Bakhsh, he now lives in Qadian. I asked him that you are coming back from the mosque, so has the prayer already been offered? He replied that there are a lot of people in the mosque and there is no more space in the mosque and so I have come back. Upon hearing this reply I also returned home and offered my prayers in the house. Upon seeing this the Promised Messiah (as) asked me why I had not gone to the mosque to offer prayers? It is a grace of God that from my childhood I respected the Promised Messiah (as) as being a prophet of God. I saw that in the manner of asking his question, there was a harshness and from his face I could detect a certain level of anger. His asking me in this way had great impact on me. In reply I said I did go to the mosque but there being no space I came back. Upon hearing this the Promised Messiah became silent but when, after offering the Friday Prayers Hazrat Maulvi Abdul Kareem Sahib (ra) came to inquire about the health of the Promised Messiah (as) the very first thing that the Promised Messiah inquired from him was, whether there were a lot of people in the mosque today. At that time I became extremely anxious because I had not gone inside the mosque. I did not know whether the man who had told me had made a mistake in his assessment or weather I had not understood him properly. I had concluded from what he had said that there was not any space inside the mosque. I became worried that if I had made a mistake in understanding or if the one who informed me had made the mistake, in both cases I would be the one held blameworthy that I had lied. Maulvi Abdul Kareem Sahib (ra) replied that yes Huzur, really there were a lot of people today. I still do not know, what was the actual reality, whether Allah made the arrangements for me to be saved and so Maulvi Sahib had confirmed what I had said or whether really that day a lot of people had indeed come to the mosque. Nevertheless, this is one incident that happened which left an indelible mark on me. From this, we can learn how much the Promised Messiah (as) was concerned about the offering of the prayers in congregation in the mosque. The reason for this was that in my childhood my eyes had suffered a serious ailment and my eyes continued to suffer pain continuously for three or four years. So much so that the doctors said that my eyesight would be lost. Upon hearing this the Promised Messiah (as) started to pray for my health with great fervor and also started to fast. I do not remember how many days he observed the fast but I believe that it was three or seven days. When it was time to open the fast on the last day, and he put something in his mouth to open the fast, at that suddenly I opened my eyes and I shouted that I had begun to see. But the severity of the illness and the continuous attacks of this illness resulted in the sight in one of my eyes to become severely affected so much so that my left eye does not have any sight in it. I can see the way but I cannot read a book. If there is a person sitting two to four feet away from me whom I know then I can recognize him by looking at him, but if there is someone whom I do not know, sitting at such a distance, I cannot recognize him by simply looking at him. Only my right eye functions fully but this also was affected by the same ailment to such a degree that I would stay awake many a nights due to it. The Promised Messiah (as) had said to all my teachers that his studies would be dependent on his own wishes. [From this also it becomes clear as to how Allah fulfilled the prophecy about him that he would be filled with knowledge of all sorts.] He has written in another place that he has read hundreds of thousands of books and he could read very fast. In any case the Promised Messiah (as) had said he should be allowed to study as much or as little as he wishes and if he does not wish to study then he should not be pressured too much because his health is not such as to bear the load of studies. The Promised Messiah (as) had repeatedly said to me that you should learn the translation of the Holy Quran and Bukhari Sharif [the book of ahadith] from Hazrat Maulvi Noorud Din Sahib. Apart from this he had also said that you should study some medicine from him because this is our family’s tradition. Master Faqirullah Sahib, he writes, who had been blessed to join us this year (he had previously left for a certain amount of time to join the non-mubayin) he used to be our mathematics teacher and in order to teach the children mathematics he would use the blackboard to solve problems. But because of my problems with vision I could not see the black board. The Black board was so far that my eyes could not see and also I could not maintain or keep looking at it for a long enough period of time. So I thought it pointless to sit in the class. If I felt like it I would go and if I felt like it I would not go. As a result Master Faqirullah Sahib complained about me to the Promised Messiah (as) saying that Huzur He does not study at all. Sometimes he comes to the school and sometimes he does not. I remember that when Master Faqirullah Sahib made this complaint to the Promised Messiah I went and hid out of great fear that the Promised Messiah (as) would be upset upon hearing this. But when the Promised Messiah (as) heard this he said to Master Faqirullah Sahib that we are very grateful to you for taking care of the child. I am happy to hear this from you that he sometimes goes to the school because in my opinion his health is not so good that he should be able to study at all. Then with a smile on his face he said, “we do not want him to open a shop to sell flour and lentils so that it would be necessary for him to master mathematics. Whether he learns mathematics or not doesn’t matter. What mathematics had the Holy Prophet (sa) and his Companions (ra) mastered? If he goes to the school that is good but he should not be forced to do so.” (But let me tell you that his mastery of mathematics was so good that even during his speeches he would carry out multiplications of many orders of magnitude easily). Upon hearing this Master Sahib came back and I started to take even more advantage of this attitude of the Promised Messiah (as) and abandoned going to school altogether. I would go perhaps once a month. This is how my education took place. In fact, I was also very much in need of acting thus because in my childhood, apart from the problem of my eyes, I also suffered difficulties from my liver and sometimes for months I was given to drink various types of liquids (water of Moong lentil). Then there were several other maladies from which I suffered which sometimes affected me from months on end. From these things everyone can gauge that what was the state of my education. On one occasion my maternal grandfather Hazrat Mir Nasir Nawab Sahib took an examination of my competency in Urdu. Even now my handwriting is not very good. But at that time my handwriting was so bad that it was totally illegible. He tried very hard to read what I had written but he could not make any sense of it . He was a person of quick temper, he became angry and went immediately to the Promised Messiah (as). I was in the house also at that time. We were already afraid of his quick temper and when he went to the Promised Messiah (as) with the complaint I became even more afraid, not knowing now what would happen. Mir Nasir Nawab Sahib came and said to the Promised Messiah (as) that you are not paying any attention to the education of Mahmood. I have examined him in Urdu, look at his exam paper. His handwriting is so bad that that no one can read what he has written. Then in the same zeal he said to the Promised Messiah (as) that you are not at all taking care and the boy’s age is being utterly wasted. When the Promised Messiah (as) saw Mir Nasir Nawab Sahib in this state of zeal, he said let us call Hazrat Maulvi Sahib. Whenever the Promised Messiah (as) used to face any difficulty, he would always call Hazrat Khalifa tul Masih I (ra). Hazrat Khalifa tul Masih I loved me very much. He came, and as usual with his head lowered he stood to one side. He never used to stand with his head held high in the presence of the Promised Messiah (as). The Promised Messiah (as) said that Maulvi Sahib I have called you with the intention of asking that MIr Sahib says that the writing of Mahmood cannot be read. My desire is that we should examine him. Saying this, the Promised Messiah (as) picked up a pen and having written two or three sentences; he gave them to me and asked me to copy them. This was the examination that the Promised Messiah (as) took. I took great care and copied what I was given. First of all, that writing was not too long. Second I only had to copy it and copying is so much easier, because the real thing to be copied, is in front of one and what is more I did the copying very slowly. When the Promised Messiah (as) saw my writing, he said I was very concerned upon hearing Mir Nasir Nawab Sahib but his handwriting seems to me to be close my own. Hazrat Khalifa tul Masih I (ra) was already favorably inclined towards me and said that Mir Sahib had become excited for no reason since it seems clear that his handwriting seems to be just fine. After the passing away of the Promised Messiah (as) Hazrat Khalifa tul Masih I (ra) said to me that I should complete the reading of Book of Ahadith (Bukhari ) from him. In fact I had told him that the Promised Messiah (as) used to tell me to study the translation of the Holy Quran and Bukhari from him. In fact I had started the study of both these book from Hazrat Khalifa tul Masih I (ra) during the lifetime of the Promised Messiah (as) and although this went on and off I had also started studying the medicine from him during the lifetime of the Promised Messiah (as). Then when Hazrat Khalifa tul Masih II started Tasheezul Azhaan, Hazrat Khalifa tul Masih I (ra) praised the topic that I had written on about the purpose and objective of this magazine to the Promised Messiah and submitted that this article is worthy of being read by the Promised Messiah (as). The Promised Messiah (as) had that magazine brought to Masjid Mubarak and I believe that he had Hazrat Maulvi Muhammad Ali Sahib read that article out aloud and he praised it. But when I met Hazrat Khalifa tul Masih I (ra) afterwards, he said your article was very good but my heart is not happy and he said that in our land a phrase is very well known that a camel is worth forty and the “toda” (baby of the camel) is worth 42; and you have not fulfilled the demands of this saying. I did not know punjabi sufficiently well to understand this phrase. Upon seeing the signs of amazement and lack of having understood on my face he said perhaps you have not understood the meaning of this. This is a phrase from our land. It is said that a man was selling a camel and next to it was also the baby of the camel who is referred to in our land as ‘toda.’ Someone asked the seller the price of the camel and he said that the price of the camel was 40 rupees but that the price of the “toda,” the baby camel was 42 rupees. When the buyer asked what is the wisdom behind this, the man replied that the ‘toda’ is a camel and a baby. He said when your father the Promised Messiah (as) wrote Brahin e Ahmadiyya, he had no such writing in front of him, but you had it there right in front of you and the hope was that you would bring something forth that would be better. Hazrat Musleh Maud writes what could some one bring forth that would be better than what a Commissioned one had produced – all that anyone can do is to dig out the treasures that they have presented and make them known to the people. 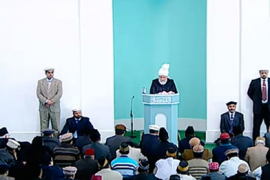 The meaning of what Khalifa tul Masih I (ra) had said was that the people who come after, have the duty to continue to build on the foundation laid by such Commissioned people of God. This is a thing which if the coming generations keep in mind, they would themselves be blessed with the grace and bounties of God and they would also be the means of bringing down the grace and the blessings of God upon their peoples. But the intent should be to move ahead of our predecessors in doing of good things. It should not be the case that if a person is the son of a thief he should look to excel in thievery. The children of parents who are steadfast in offering their prayers should try to excel their parents in the offering their prayers. Then at another place he states with regard to the grand lofty position of the Holy Quran as follows. I remember an example of my childhood foolishness. When I was a young child, when the enemies of the Promised Messiah (as) would come, and level accusations against him, so because the Promised Messiah (as) would address them in a very simple and straightforward, easy to understand manner, I would sometimes think that perhaps he would not be able to combat the cleverness of such a person’s attack. But when the opponent would increase in his opposition, then it would appear as if some heavenly power has taken a hold of his heart and he would respond with such power that the assembly would become totally silent. This is the same kind of folly so that when someone raises an allegation or a criticism against the Holy Quran they say stop and stay quiet or your faith will be damaged. This is what many mullahs say when a criticism is made of the Holy Quran, that these criticisms are not understandable and many new converts to Ahmadiyyat write that they are told that because such and such issue has not been understood therefore be quiet otherwise your faith will be lost. But this is a frivolous, vain statement. What is required is that the criticisms leveled against the Holy Quran should be responded to with such answers that even the enemy should be forced to admit to its truth rather than this that the person who is making the criticism or allegation should be forbidden from making it and the doubts in his heart should be left to be remain there. I remember a statement of the Promised Messiah (as) very well and I have heard it with my own ears directly from him many times. He used to say that if all the people in the world were like Hazrat Abu Bakar (ra) then such a big Holy Quran would not have been needed and only the “baa,” in other words the first letter ‘b” of the first word of the first verse of the Holy Quran would have been sufficient. This large amount of highly meaningful and full of varieties content that has been revealed by way of the Holy Quran has been revealed by virtue of the existence of Abu Jahal. If there had not been people like Abu Jahal then such a detailed Holy Quran would not have been needed. So the Holy Quran is the word of God. As many criticisms as are leveled against it so much would its beauties be revealed as a result. So this fear that if the criticism is powerful, how will it be responded to is a satanic doubt. Is the word of God going to defend and safeguard our faith or are we the ones who are responsible for the safeguarding of the Word of God? That scripture which needs man to safeguard it, is a false scripture and is worthy of being abandoned and is of no use to us. That Holy Quran is of use to us which is in no need of any human being for its safeguarding but infact its Guardian should be God Himself and whatever allegation is leveled against it, it should respond to it, itself and it should manifest its greatness and glory itself. Our Holy Quran is exactly like this. Then talking about how one should deal with the weakness of oneself he says this is an incident from the life of the Promised Messiah (as) himself. Once in a street in Lahore a person shoved the Promised Messiah (as) so hard that he fell down. Seeing this the people with him became very excited and it was well nigh possible that they would attack this person, but the Promised Messiah (as) said he has done this in a state of zeal in the support of truth. Do not say anything to him. So it is clear that the Prophets of God do not speak out of needs of their own ego. But rather they speak in order to speak for the honor and greatness of God. So we should not think that the Prophets of God behave as the ordinary people behave. There is a huge difference between the actions of the Prophets of God and the actions of the ordinary people. They act for God and the ordinary people act for themselves. Then he says that the Promised Messiah (as) used to make mention of the prayer of Hazrat Muawia (ra), that he had once missed the offering of the Fajar prayer at its appointed time but as a consequence of this mistake, he did not fall down, no, in fact he ascended to new heights. So the person who is conscious and mindful of having committed a sin is the one who makes progress and when a person loses his awareness of having committed a sin, such a one becomes heedless of having committed a sin, then such a person becomes involved in sinfulness. So a believer should ponder over the prayer, ‘guide us along a straight path,’ and he should understand that he has not found refuge from all dangers. He can be safe only when he hears the voice of God saying this to him. So man should always continue to evaluate his state of weakness. Such a one will see the doors to spiritual progress open up to him and the one who does not do this is the one to whom the doors to spiritual progress become straitened and such a one ultimately becomes lost. The Jama’at is opposed, the Prophets are opposed and such opposition becomes the means for progress and advancements. He writes that we heard an incident from the Promised Messiah (as) many a times. He used to say that the enemies who vilify us and abuse us and oppose us, we entertain the hope that the blessed souls from among them will come towards us, but when neither the people shout abuse at us nor oppose us and they become totally silent, then this becomes a source of pain for us. The Promised Messiah (as) use to say that the case of the Prophet is like of that old woman about whom it was well known that she was somewhat crazy and the children of the city used to bother her and she used to abuse them and curse them. Finally the parents of the children devised the plan that the children should be prevented from molesting the old woman so they guided the children and advised them to desist; but they were children, they were not going to stop. So this plan came to naught and finally the parents decided that the children should not be allowed to go outside and it was decided that the doors would be kept closed. So they started to act on this plan and for two or three days they did not allow the children to go out. When this old woman saw that the children no longer bothered her, she went home to home asking each person where has your child gone, has some snake bitten him or has he died due to cholera, or has the roof fallen on him or has he been struck by lightning. So she would go to every door and talk all manner of such things till the people realized that the old woman has started cursing their children even more from before, so what have we gained by keeping the children all locked up and they decided to release the children and allowed them to go outside. The Promised Messiah (as) used to say that this is the condition of the Prophet. When the opposition intensifies, he feels pain and when the opponents become silent even then he feels pain, because unless and until there is opposition, the attention of the people is not drawn towards the Divine movement. Of course, the Prophet does not hurl abuse and does not vilify the people, he only prays for them. But when the opposition intensifies, then he prays for the opponents also so that from among them the blessed souls may accept the truth. Then talking about opposition being a source of progress Hazrat Khalifatul Masih II (ra) says that once a Maulvi Sahib came to the Promised Messiah (as) who was a famous poet and a writer. Nawab Sahib of Rampur had appointed him to write a dictionary of Urdu phrases. He told the Promised Messiah (as) that Nawab Rampur Sahib possessed the manuscripts of Minai. He had compiled a very weighty dictionary of Urdu but he had not completed it yet when Nawab Sahib passed away. Nawab Sahib Rampur has given me those manuscripts and has directed me to complete them. The Promised Messiah (as) asked that there is great opposition in Rampur and you are a resident of the area, how was your attention drawn towards performing the Bai’at. He said that someone had given me the copy of Dur-e-Sameen [collection of poems of the Promised Messiah (as)] and because I myself am a poet, I read your poetry and I became very impressed with it because I found it absolutely filled with the love of the Holy Prophet (sa). Then he says that Maulvi Sanaullah Sahib came there and he delivered a lecture and in this lecture he informed us that Mirza Sahib is an extreme enemy of Islam and is guilty of disrespecting the Holy Prophet (sa). When I listened to his speech then I realized that Mirza Sahib must definitely be true. Otherwise what was the need for this Maulvi Sahib to utter such a great lie. The man who possesses such love for the Prophet in his heart that his poetry is so very full of expression of this love, if some maulvi says concerning such a person that he is a great enemy of the Holy Prophet then he is certainly a liar. And the person who he alleges to be disrespectful of the Prophet must be true, otherwise there was no need for such a lecturer to present such a false arguments in support of his statements. He should have stated the truth, that although he has praised the Holy Prophet immensely in the Durr-e-Sameen, and has praised God Mightily, but he is nevertheless a liar. If he had said such a thing then that would be okay then that would not be so bad. But instead, he abandoned the truth wholly and said that this man speaks ill concerning God and his Messenger. I listened to his speech and then immediately realized that Mirza Sahib is true in his claim and I became ready to perform the Bai’at at your hand. So the reality is that many a times the enemy tries to arouse opposition among the people against the believers but instead of succeeding in his attempt, that effort proves beneficial in favor of believers. In another incident he says some very sincere friends used to live near Chak Sikandar. Hazrat Khalifatul Masih II (ra) writes that I was very young and I remember well that these brothers used to come and sit in the company of the Promised Messiah (as) with great zeal and would enjoy such company highly. There was a brother in law of the Promised Messiah (as) by the name of Ali Sher (he was the brother of the Promised Messiah’s first wife). Because the Promised Messiah had married Hazrat Umm-ul-Momineen, in accordance with the direction of Allah the Exalted, the relatives of his first wife had started to oppose him. The first wife of the Promised Messiah (as) was a very righteous lady. I have seen that she used to love us so much that in our childhood that we used to think that she loved us more than our mother. (So the misimpression that exists among some people that there was no connection with the first wife is also not true) Hazrat Khalifatul Masih II (ra) says that when our elder sister Ismat passed away Hazrat Umm-ul-Momineen told us that when Ismat became ill and her condition became very extreme then just like the condition of a chicken when it is about to be slaughtered, Ismat was found in an extreme state of anguish and was asking that her mother be called meaning the older mother. The Promised Messiah (as) called her and when she came and placed her hand in the hands of Ismat, she became very contented and satisfied and then she passed away. So she was a very righteous lady and loved the children of her husband’s second wife very much. She loved the Promised Messiah (as) himself also very much and held him in great esteem and would not tolerate hearing anything bad about him from anyone. But her brothers were very prejudiced and they would try to deceive those who would visit and they would say to them that I am his brother and relative and I know that he has just gotten established a store for selling and buying and nothing else. This is what they would say about the Promised Messiah (as) that he has established all this by way of business and his claim of prophethood is just a deception and hearing these things the people of weak faith would be deceived thinking that if the brother is saying these things they must be true. Once these brothers whom I just mentioned [living near Chak Sikander] came to Qadian. Up till that time the Bahishti Maqbara had not been made. This incident is of a date much earlier than that and at that time those people who used to come to Qadian, in order to see the blessed places of Qadian, they would either go to Masjid Mubarak or go and sit in the company of Hazrat Khalifatul Masih I (ra) or go and sit in the garden of our grandfather. They use to think that because this is the garden of the father of the Promised Messiah (as), so this place is also a blessed place. On the way to this Garden was the place which became the location for Daaru Zuafa and before this was built this land was in the possession of Ali Sher Sahib who was the brother of the Promised Messiah’s first wife. And he was fond of beautifying this place with a small garden in it. He would always have a long rod in his hand and a big beard but he was a staunch opponent of the community and would always be on the look out for any Ahmadi who he could deceive. Once these five brothers came to Qadian and started on their way to see the garden. From among them, one of the brothers was making great strides and leading and Mirza Ali Sher recognized that they were visitors from outside of Qadian and he called out to them in a loud voice saying, “brother, please come and listen to me.” The one who was leading went to him. Mirza Sher Ali asked why have you come here? He replied that we have heard that Mirza Sahib has laid claim to being the Messiah and the Mahdi so we have come here to see him because he appears to us to be true in his claims. He said that how is it that you have fallen into his deception. Do you not realize that this man has established it as a business in order to earn his daily living? He is my brother and I know his situation very well. You are people who live outside of Qadian, what knowledge can you have of the real state of affairs. You should not fall for his deception, otherwise you will suffer damage. Listening to his statements this Ahmadi started moving towards him with great zeal and asked him to shake his hands. Sher Ali Sahib thought that my statements have had great impact on him and he has become convinced of my righteousness. Because it was his custom to go on talking and frequently interjecting, ‘SubhanAllah’ and ‘Alhamdolillah’ in the middle of his sentences. So he extended his hands towards him with great fervor and thought to himself that today I have captured valuable prey. The brother who was ahead of everybody else got a hold of his hands firmly and started calling his other brothers loudly to come quickly I have an important thing to show you. Hazrat Khalifatul Masih II (ra) writes that our uncle thought that this man had been affected greatly by his statements and now he was calling his brothers so that he may tell them that what he is saying is true. And he was so very happy in his own heart that today my attack has found its target. But when the four other brothers arrived and the five became together, the first started to say that we used to read in the Holy Quran and the Ahadith that there is a Satan in the world but we could never find him but today, by a sheer good fortune, we have found that satan who is trying to misguide us. Then at another place he says that there is no doubt that the Grace of God is like a mighty river and if a drop of water is taken from the river what diminution can this cause in the state of the river. It is a misfortune of man himself that he deprives himself from being the beneficiary from the Grace of God and turns his face. And when a Commissioned one comes, the people, thinking him to be insignificant, they turn away from him. Then he writes that the parents of Baba Nanak use to look down upon him and use to say that he has damaged their business and this useless child has been born in our house. If his parents were to come back to life and visit this age and see that, that child who they use to consider as insignificant, is revered by hundreds and thousands of people who are ready to sacrifice their lives for him and among them are many millionaires, they would be astonished at seeing this. But the people, due to their own ignorance and stupidity, think that the Commissioned one of God is insignificant and by accepting him what do we stand to gain. But Allah, the Exalted, chooses just such people who appear to be insignificant but a time comes when hundreds of thousands of people become ready to sacrifice their lives for them. In those days the Promised Messiah (as) had a servant who was called Pira. This man who was so ignorant that he would mix paraffin oil in his food and consume it. The promised Messiah (as) used to send him some times for this or that task to Batala and on one such occasion he happened to come across Maulvi Muhammad Hussain Batalwi Sahib who was known as the leader of the Ahle Hadith. And he was considered to be a weighty and great Maulvi. His main occupation in those days was that when anyone came to Batala to go to Qadian, he would meet them and would say to them that this man, meaning the Promised Messiah, has established a business and he is a liar and what will you achieve by going to Qadian. But despite this, the people still would come to Qadian and would not desist from coming to Qadian by virtue of the attempts of Maulvi Muhammad Hussain Batalvi Sahib to stop them. So such Commissioned ones of God do appear to be small and insignificant in the beginning and appear to be of no consequence to those who look upon material things. This is what was thought about the Promised Messiah (as) also. But today, Hazrat Khalifa tul Masih II (ra) wrote at that time, his Jama’at has spread to the corners of the earth and now, of course, by the grace Allah it has spread much more. What to talk of the lifetime of the Promised Messiah (as) on the occasion of the last Jalsa during the Promised Messiah (as), only 700 people had come. And Hazrat Khalifa tul Masih II says, during a Friday Sermon, that now in Masjid Aqsa more than 4,000 people are participating, and today in this part of the world, even in this mosque, more than 5 or 6 thousand people are listening to this sermon. Hazrat Khalifa tul Masih II (ra) says that in the time of the Promised Messiah (as), all the peoples of India had opposed him in the most intense manner possible but despite all those oppositions our movement progressed in India and also all over the world and jama’ats were established inside india and all over the world. So much so that today our missions are working all over the world. In England, America, China, Japan, Java, Sumatra, and in all the countries in Europe we have established our missions and the work of preaching is ongoing. The people of Africa are being conveyed the message and the people of America and Europe, who were erstwhile involved in associating partners with God, are embracing Islam in droves and the reason for this is only that Allah has established a new faith in our hearts through his messenger from which the rest of the people are deprived. Similarly, when the people opposed the Promised Messiah (as), Allah showed the Promised Messiah (as) that a very potent form of plague would break out in the land and this is what happened and thousands died as a consequence. But even during this plague, despite the fact that the occurrence of the plague was in support of his truthfulness, yet, becoming mercy personified, he offered most fervent prayers to have this tribulation postponed or delayed. He prayed so fervently and with such passion that Maulvi Abdul Karim Sahib who used to live in the upper part of Masjid Mubarak says that one day he heard someone crying most pitifully and in great pain like a mother in pain at childbirth. I listened attentively and found that the Promised Messiah (as) was praying to God Almighty crying fervently saying that ‘O Allah, if all of the people die, then who will be left to believe in me.’ This also speaks very highly to the truth of the Promised Messiah (as). The plague had been sent as a sign of his truthfulness, but his heart was moved to ask for mercy. This is the level of mercy, this is the level of mercy found in the heart of a Prophet of God. May Allah bestow jealousy for the faith in the heart of every Ahmadi. May He cause everyone to increase their connection with God. May He develop patience and fortitude in everyone. And may He bless us the ability to pray to save humanity also. May He bestow upon us the ability to overcome our egos with our humility and humbleness and make us walk on the paths that lead to His Pleasure in a complete way. May we be the ones to follow the ways that will enable us to accomplish the mission of the Promised Messiah (as). And may we be those who do everything that the Promised Messiah (as) had wished or desired for his followers to do. Aameen.